Beaming Buggie Take-Along Toy is rated 3.7 out of 5 by 3. This little lightning bug will light up baby's world! 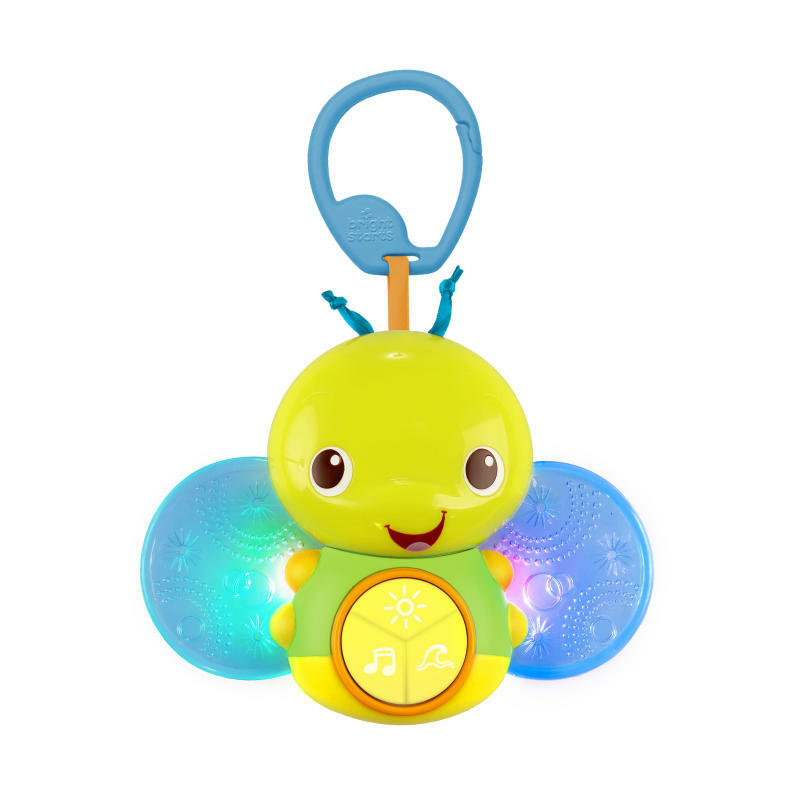 The Beaming Buggie™ take-along toy from Bright Starts™ entertains baby with lights and sounds. The magical wings light up to create a mesmerizing light show. Sound selections include soothing waves and lullabies. Auto shut-off with 15 minute timer can even help lull baby to sleep. The link makes buggie easy to attach to carriers, diaper bags, cribs and more. Rated 1 out of 5 by VManahan from Stops working after month Defective - was a favorite toy but stopped working properly after a month. Changed batteries and never worked the same again. Plays for a few seconds then turns off. Changed batteries again & now doesn't come on at all. Looks like other people having same problem. Shame because baby ADORED the music; was only thing that would get her to sleep. Rated 5 out of 5 by megz797 from Son LOVES IT! I got this as a shower gift and currently have it hanging on my sons car seat. He LOVES it! We turn the music on in the car and he falls right asleep. Also while picking him up from daycare its dark out so turn on the light choice and he stares at it in amazement! Hope it never dies on me because I would have to run out that night and find another!! Rated 5 out of 5 by Laney Bug from Best Infant Toy! Our daughter is 4 months old now, and we have had this toy since she was two months. It is amazing. She loves to watch the colors change, and the ocean sounds help her relax. It also has music, but she likes the waves better. We have tried to buy another one, but they are always sold out. People who see it love it, and want to know where they can get one too. It is her our daughter's favorite toy to date. It is also on a timer, so it turns off after 15 minutes or so. This is great for saving the batteries. Love, love, love it!!! it's a must have.